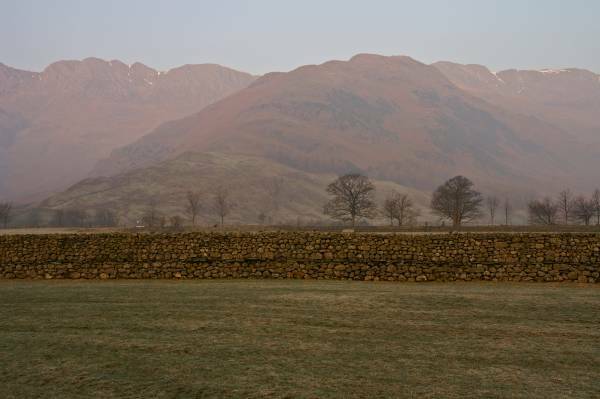 Bow Fell and Esk Pike from Great Langdale. Start. Old Dungeon Ghyll Hotel. Route. Old Dungeon Ghyll Hotel - Stool End - The Band - White Stones - Earing Crag - Three Tarns - Bow Fell - Ore Gap - Esk Pike - Esk hause - Angle Tarn - Rossett Pike - Buck Pike - Black Crags - Stake Gill - Mickleden - Old Dungeon Ghyll Hotel. Notes. 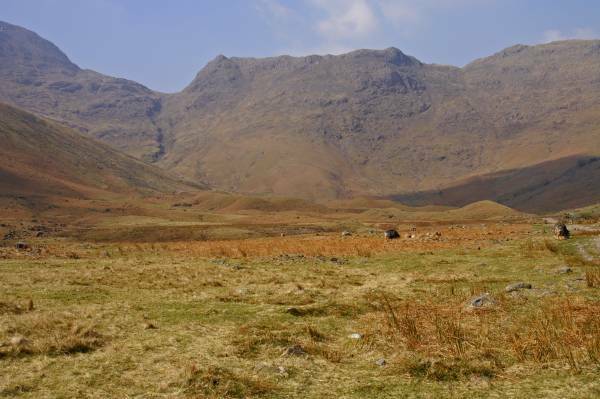 Today I set off for Great Langdale my eyes set firmly on the ever popular Bow Fell, and not so popular Esk Pike, if time permitted I would finish my day on Rossett Pike, where an excellent path traverses the face of Black Crags to reach Stake Pass. My day begun in the Old Dungeon Ghyll car park, I made my way west along the valley bottom road to access the lane leading to Stool End Farm, the farm marked the start of my long ascent up and over The Band, eventually reaching the coll at Three Tarns, time for a brew, from the coll it's a short steep climb to the summit of Bow Fell. Leaving Bow Fell I made my way north before swinging east to reach the Obvious Coll, marked on the map as Ore Gap, in front of me a clear path lead up the southern slopes of Esk Pike. 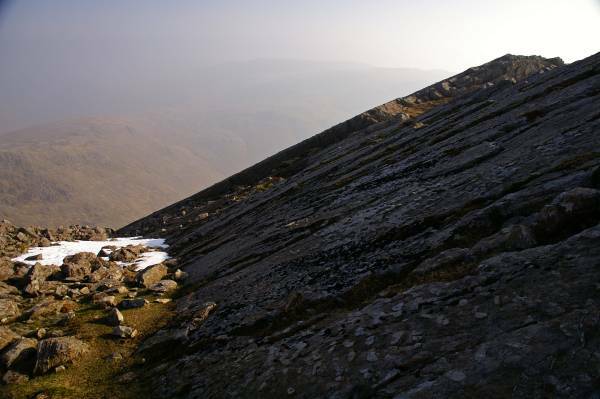 If you visit Esk Pike's rocky summit you'll probabley have it to yourself, most walkers descent from Ore Gap missing out on the best summit of the round, on a clear day the views are quite stunning. 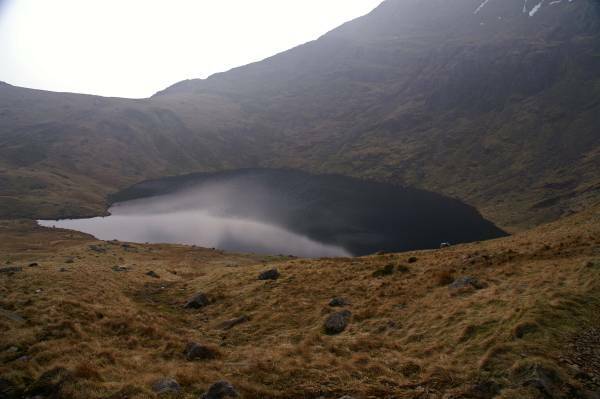 After another brew I made the descent to Esk Hause, ignoring the shelter I turned southeast passing Angle Tarn before the short ascent to Rossett Pike, I'd been walking over hard, loose surfaces all day, my feet are aching, my ankle and knee joints beginning to object. I made my descent on a wonderful green path, soft under foot, no discomfort here. east above Rossett Crags to reach Little Gill, here a narrow path traverses under Black Crags making an easy gradual descent to Stake Pass. 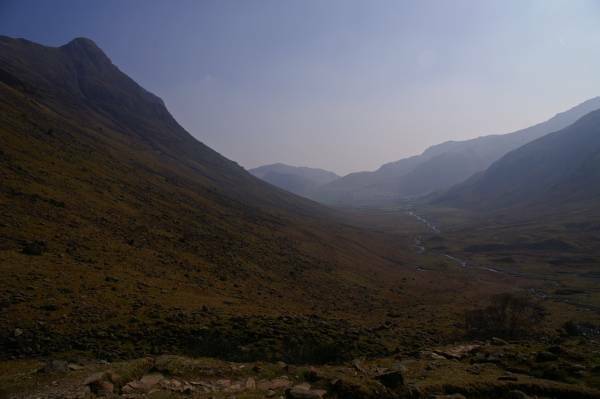 I was soon on the pitch path leading down Stake Gill, I soon found myself striding out along Mickleden straight into the Walkers Bar of the Old Dungeon Ghyll Hotel. 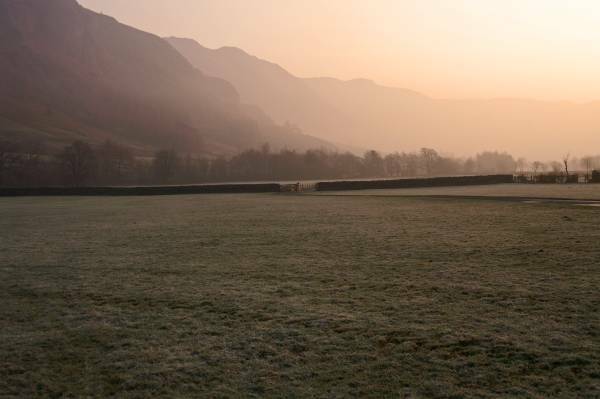 Early morning across the pastures of Great Langdale. 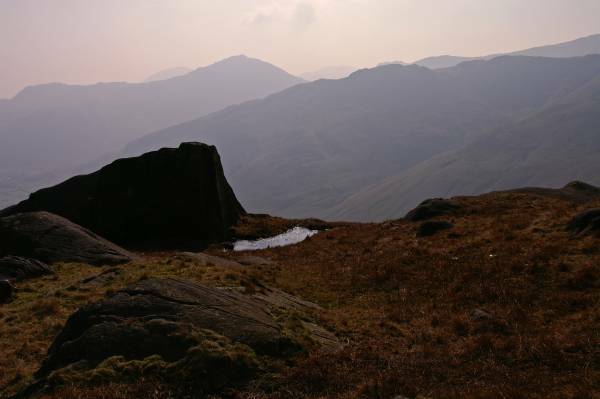 On the short walk to Stool End with stunning views to Side Pike. The Band and Crinkle Crags seen from near Stool End. 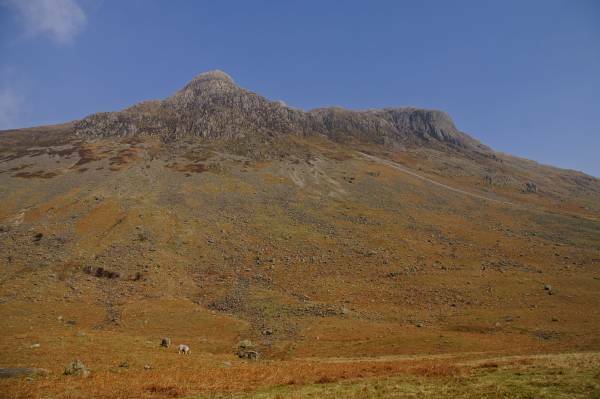 The cliffs of Pike of Stickle and Loft Crag seen from the ascent of The Band. 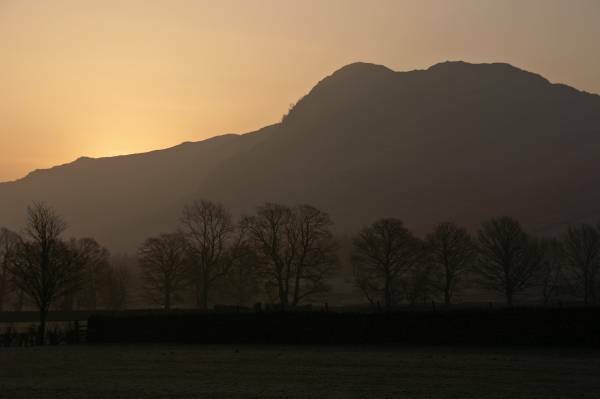 Magical light over Great Langdale. 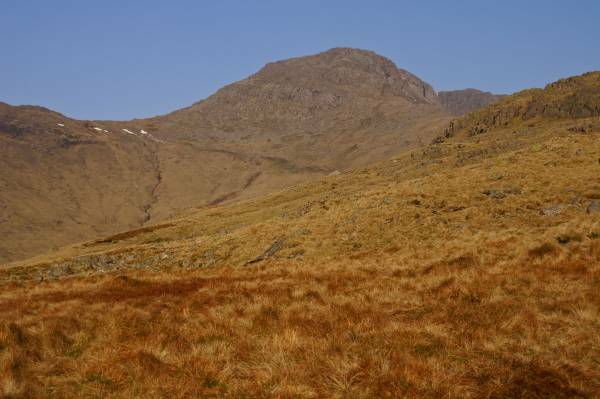 The first view of Bow Fell. 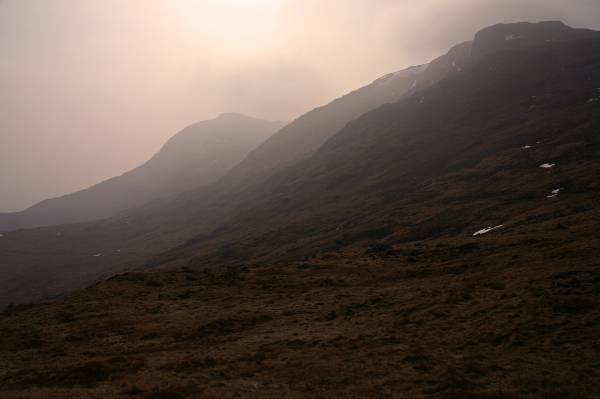 Stunning light at the coll at Three Tarns, looking to the Crinkle Crags. 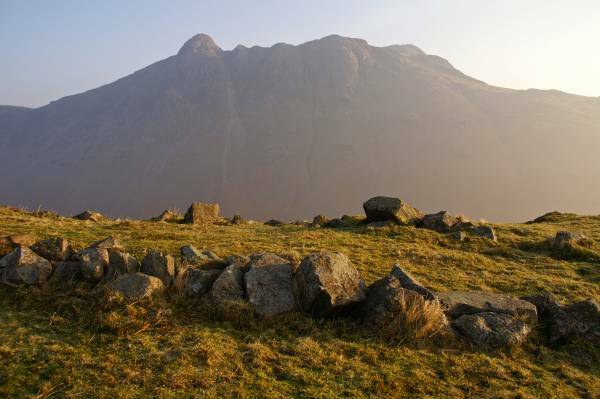 The Great Slab on Flat Crags passed in sight of the summit of Bow Fell. 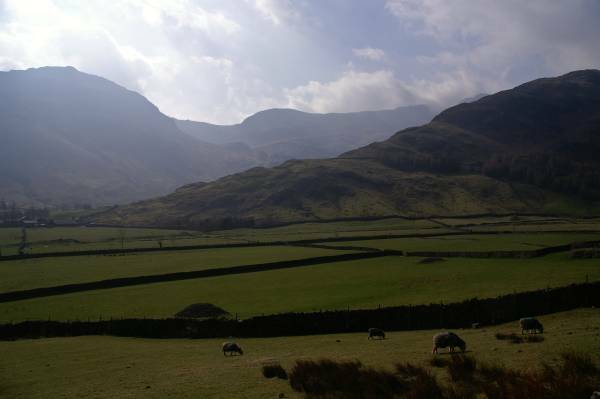 The Scafell massif seen over Pike de Bield. 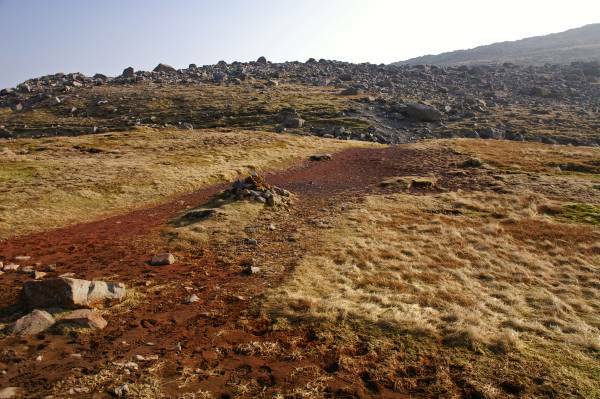 Ore Gap "The Obvious Coll" where iron stained clay meets grey Lakeland rock. On Esk Pike with views to Great End. 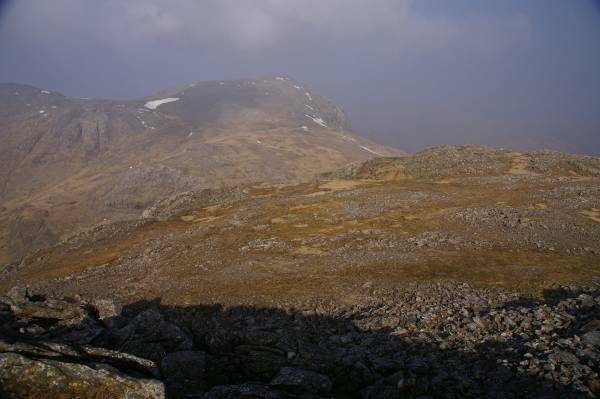 Looking to Ill Crag from Esk Hause. 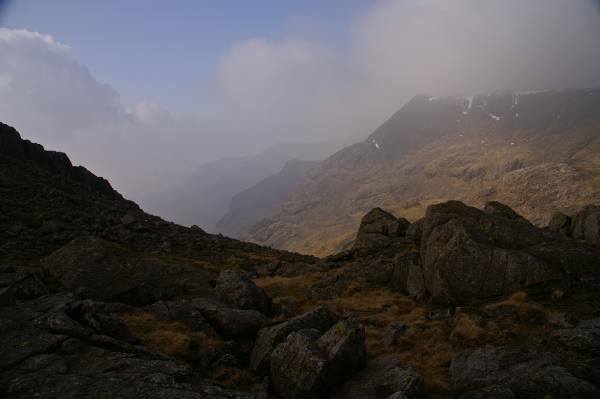 On the slopes of Esk Hause looking to Bow Fell and Esk Pike through the morning haze. 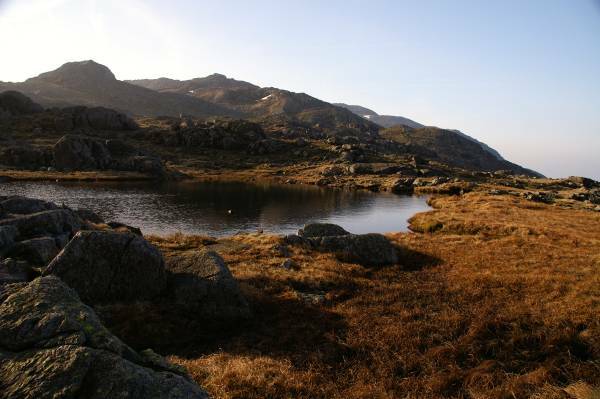 Angle Tarn in the hills above Langdale. 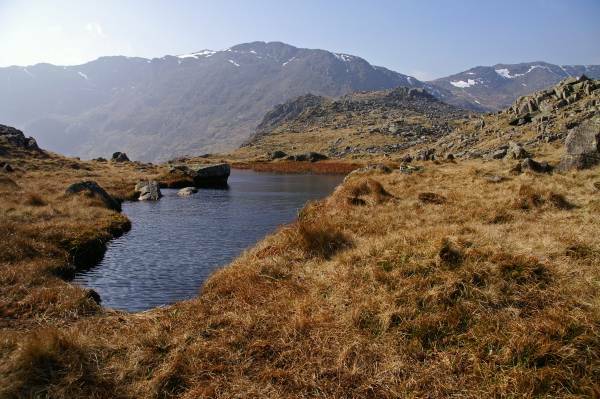 Backed by Bow Fell and Esk Pike the much lower Rossett Pike, seen from the small unamed tarn above Rossett Crags. 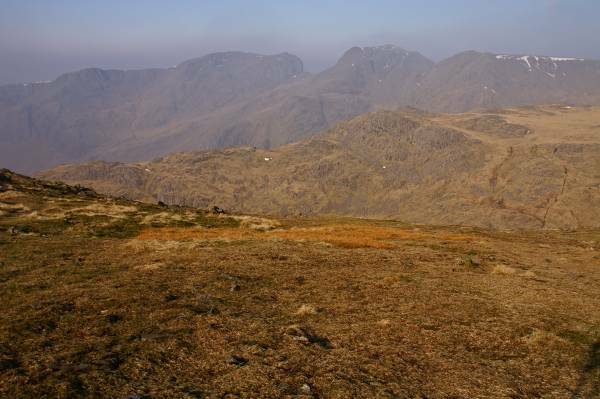 Shining levels, Pike of Blisco seen across The Band. 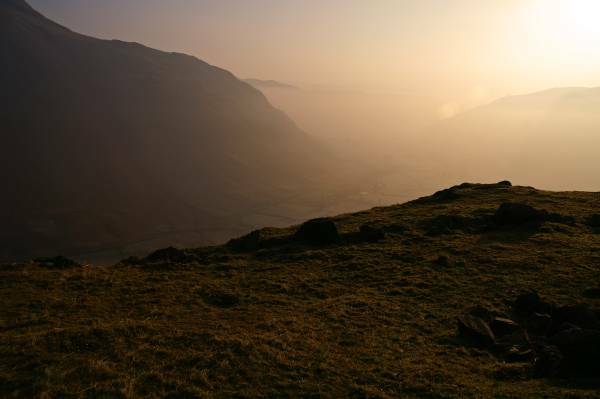 Spectacular but hazy views the length of Mickleden, seen from Stake Pass. Views back to Rossett Pike. Across the green fields of Langdale the lower slopes of The Band ascended earlier, to the left the precipitous cliffs of Pike of Blisco.